// 1987 Metro Link FEIS. 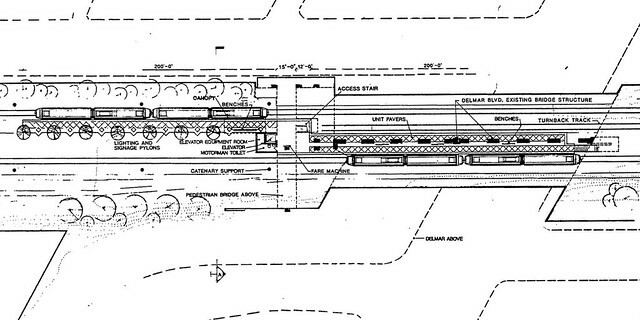 These drawings of the Delmar Loop MetroLink station are from the 1987 Metro Link Final Environmental Impact Statement. Obviously, plans for the station were changed prior to construction. 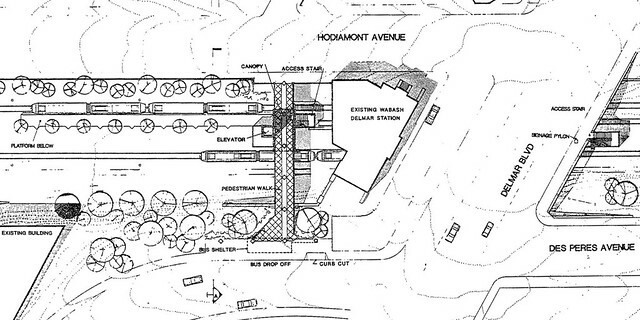 In the drawings, a pedestrian bridge crosses the MetroLink tracks less than 50 ft north of the existing Wabash Station building connecting Des Peres Ave with Hodiamont Ave. Stairs and an elevator lead down to the station platforms below. The station platform was designed in a very odd split island-like arrangement. The westbound platform was located just north of the Wabash building while the eastbound island-link platform was tucked underneath the building and Delmar Blvd. A third track connected to the north side of the eastbound platform allowed trains to quickly turn around. The manner in which the Delmar bridge over the MetroLink tracks was recently rebuilt precludes any possibility of moving the station underneath Delmar.